Thank you all for joining me for another Thursday. As usual I have prepared five topics to breeze through. Here we go! First Time Doing This in South Carolina: Yesterday I went and had something done for the first time since moving to the South. Feeling a little like a bum and not in line with the beach dude type persona, I went and got my hair cut. Not knowing the area too well and wanting to get a really nice cut since I work in the administrative building on campus I put a lot of thought into where I wanted to go. After numerous referrals and internet searches I found my place…it is called Great Clips. Call me tacky but I am a Great Clips guy. I went to the store and got right in. To make things even sweeter they had all my past haircut information from Missoula in their computer. I had a delightful conversation with my stylist Shelley and she managed to make an ugly guy look just a little bit less ugly. I went and got my hair cut yesterday at Great Clips in Myrtle Beach. “Lucy”: Last Friday night, Sidney and I went to the movie “Lucy.” Starring Scarlett Johansson and Morgan Freeman it was an extremely entertaining film. Touching on the concept of human beings only using 10% of their brains it hypothesized on what would happen if a drug existed that enabled 100% usage. While some of the science-fiction went a little over my head there was no denying the action, acting, and storyline exhibited in the film. Some of the scenes were incredible. 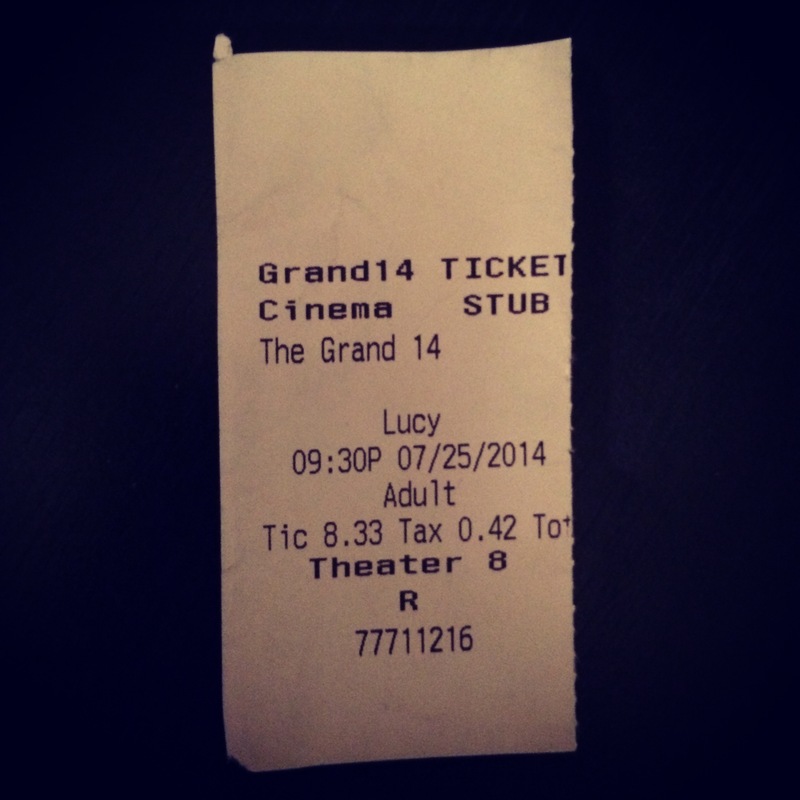 If you want a fresh and entertaining movie that will keep you on the edge of your seat for an hour and a half I highly recommend “Lucy.” It is a good one to see in the theaters. 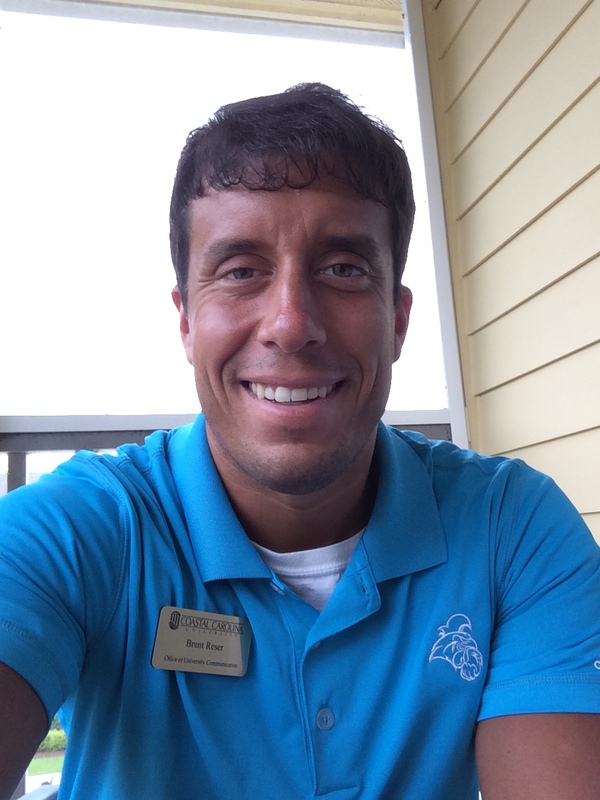 Tobacco Free: Last week for my Coastal Carolina University update I brought news about the change of beverage provider from Coke to Pepsi. Tonight I am happy to report that tomorrow the CCU campus will go tobacco-free. You have to understand that many places in the South still hold very tightly to certain things. Using tobacco is one of them. While many universities across the country went tobacco free long ago you will find campuses in this area that are resistant to making such a change. Because of this, tomorrow is a big deal. Personally I am ecstatic. This makes our campus healthier and more beautiful. I work right next to the woman who over the past three months has educated our campus on the changes and options that will result from this big move. Let me tell you, her and others have put a lot into making this initiative successful. Bring on August 1! The Unexplained: I am a big enough loser to pay $10 for a nerdy magazine while standing in line at a CVS. 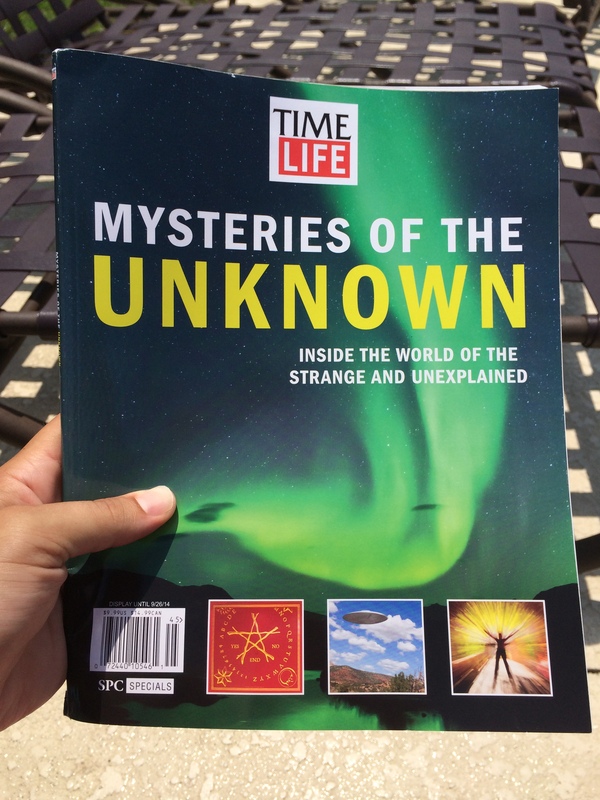 This past weekend I purchased “Mysteries of the Unknown,” a special edition magazine published by Time. The over 90-page publication had stories on everything from ESP to the Bermuda Triangle to vampires to haunted houses to spontaneous human combustion to Bigfoot. I eagerly read every page of the book and enjoyed reading the arguments both for and against the different phenomena. In the magazine I found the articles dealing with Harry Houdini, “The 27 Club,” and the UFO sightings at Chicago’s O’Hare airport especially interesting. If you are interested in weird stuff like this let me know and I will pass on the magazine to you (please save yourself the $10). I enjoyed reading this magazine! Funny Feeling: In the intercollegiate athletics world, August 1 is the widely recognized date where the party is over and the beginning of a period of seven or eight months starts where you won’t see the light of day because you are working so long and hard. For the first time in several years I am not under that type of pressure. Sure, things are starting to heat up a lot in my new position but it isn’t the overwhelming feeling you get once August rolls around in intercollegiate athletics. Safe to say I am absolutely content with where I am now. I got one very exciting weekend planned! I will try to fill you all in on it with a short blog post tomorrow. Until then, have a great Thursday evening. Don’t Blink. I have a certain complex that some people find weird. On the other side of the coin, I am sure other people find it justified and practice it as well. To put it simply, I can’t frequent certain businesses without buying something because of my fear that people will perceive me as rude. Take for example yesterday. I frequented eight stores in a wild goose hunt to find potato chips. Seven of the stores I went inside did not have the sole product I was looking for. Out of those seven stores, five of them were either convenient stores or pharmacies. Right when I walked in the person working the counter saw me walk in and look like a complete idiot as I searched fruitlessly for the #DoUsAFlavor Lay’s potato chips. When I realized that I was at a dead end I couldn’t just walk out of the store. I felt compelled to buy something, either a pack of gum or a bottle of water. I can’t help it. I feel like the store employees think of me as a weirdo, a shoplifter, or a cheapskate when I walk in a store and then immediately walk out empty handed. In order to avoid this uneasiness I usually always make sure to purchase something. Most servers won’t even hide their disgust for such a stunt. If you pull that you can expect an eye roll and the silent treatment for the rest of the time you are sitting in that booth. I can’t handle that. I don’t want the scorn from the restaurant staff and to be honest I am just too nice of a person. I want to make everyone happy, even if it means at the expense of wasted money, an overload of calories, and a killer stomachache. Same goes for a bar. If someone pleads for me to meet them at a certain neighborhood hangout I feel obligated to order something even if all I wanted to do was drink glass after glass of water at my apartment. Whether it be a beer or a fancy non-alcoholic drink I feel compelled to spend money on something and tip the bartender. It is just my self-conscious and people pleasing nature that takes over. Supermarkets and stores in the mall are places where I feel comfortable walking out while not paying a dime. But if I walk into a small convenient store where I am watched from the time I walk in to when I walk out or if I enter a service industry location you can bet my wallet is coming out. I don’t know if this will ever change. Don’t Blink. If I want something I will usually do anything to get it, even if it is just for potato chips. After work today I went to EIGHT different stores in search of the new #DoUsAFlavor Lay’s potato chips. 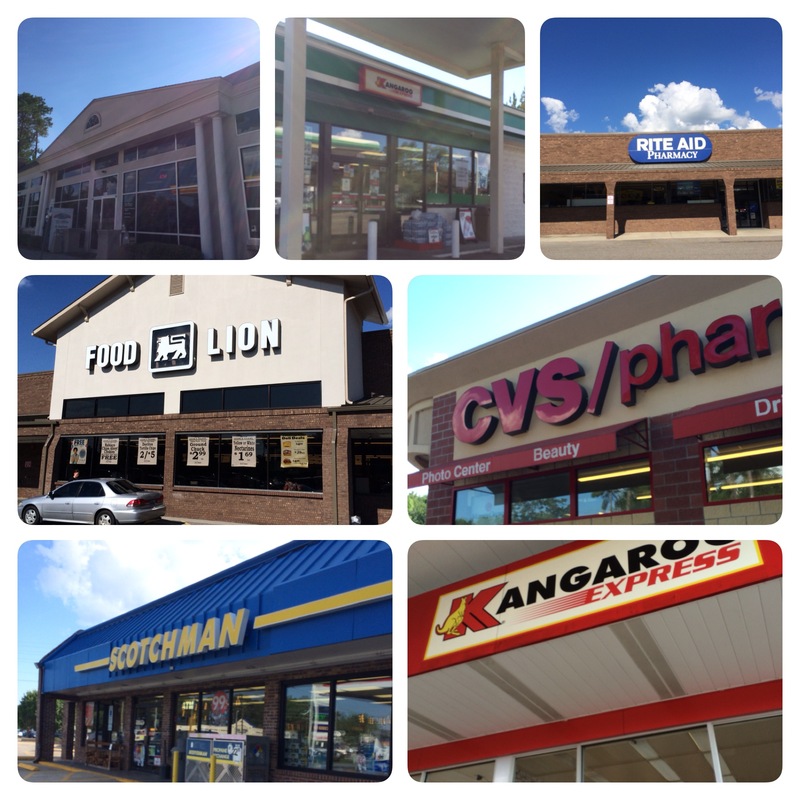 The first seven locations on my trek through convenient stores, pharmacies, and supermarkets ended in failure as I was shut out at each one. However, I experienced semi-success when I hopped in a Kangaroo store just about a mile away from my apartment. I was only able to take photos of 7 of the 8 places I went to because a creepy guy was standing outside one of the convenient stores and I didn’t want to do anything to get him angry. The Kangaroo store in the bottom right hand corner was the location that had the chips. I say “semi-success” because unfortunately the gas station did not have one of the four flavors, the much heralded Cappuccino potato chip. The employee working the counter told me that the truck driver who brought in the cargo found that potato chip so disgusting that he didn’t even bother to bring it to the Kangaroo stores on his route. What could I do? After getting in and out of my car almost ten times in the humid heat just to be disappointed all but once, I considered myself fortunate to have even gotten my hands on three of the flavors. When I eventually do come across a Cappuccino bag I will add it to this post. 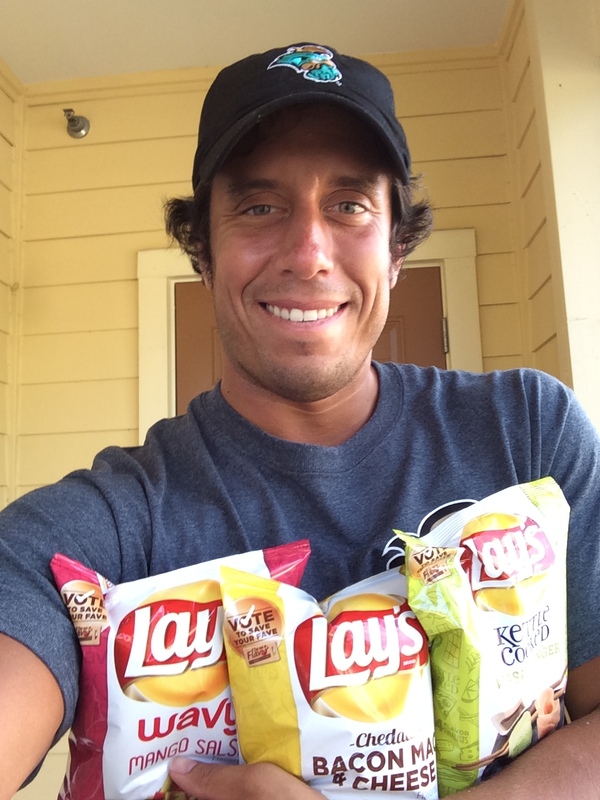 I got my hands on three of the #DoUsAFlavor Lay’s potato chips. 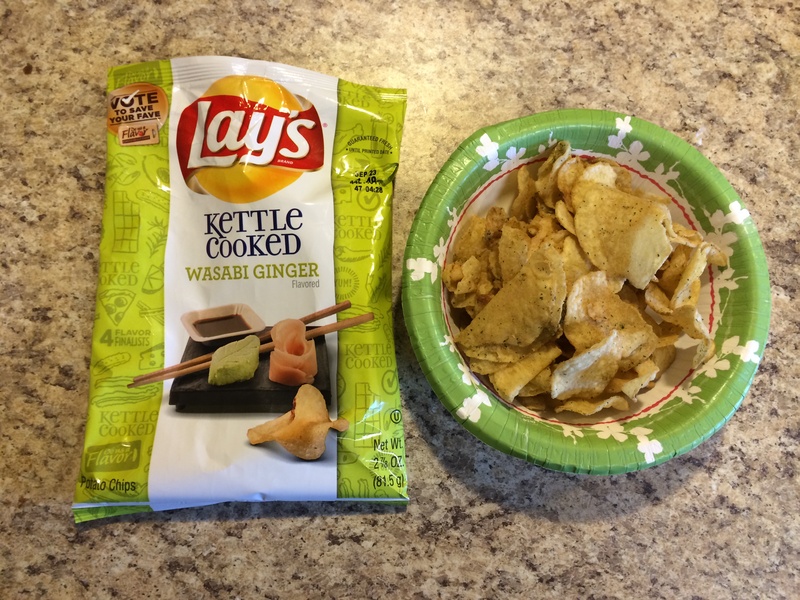 Here is a look at the Wasabi Ginger chips. I wanted to make sure to give you a look at the packaging and chip itself. I tried this chip first and I almost thought it was a joke because it was so bad. The taste itself was mild but still enough to repulse me. I kid you not, the chip tasted like chemicals! After the first chip I tried another one to confirm the nastiness. It was still there. That was enough for me, I rolled up the bag and shook my head. Initially I hoped for a spicy chip with a unique taste but chalk that notion up to wishful thinking. The Wasabi Ginger chip was worse than the Chicken & Waffles chip. I present to you the Wavy Mango Salsa chips. After the terrible experience with the Wasabi chip a bad feeling started to come over me. What if these other two flavors were busts too? Luckily my fears went unfounded. The Mango Salsa chip, the one I thought I would dislike the most, was an amazingly pleasant surprise. My first thought when I put the chip in my mouth? It tasted like Trix cereal! In a good way, of course. The initial Trix taste gradually went away and was replaced with a semisweet, satisfying taste. I immediately started to eat more chips. A completely fresh taste in wavy form I was impressed. As I was eating I kept thinking that these chips would taste even more incredible with some actual mango salsa to dip them in. 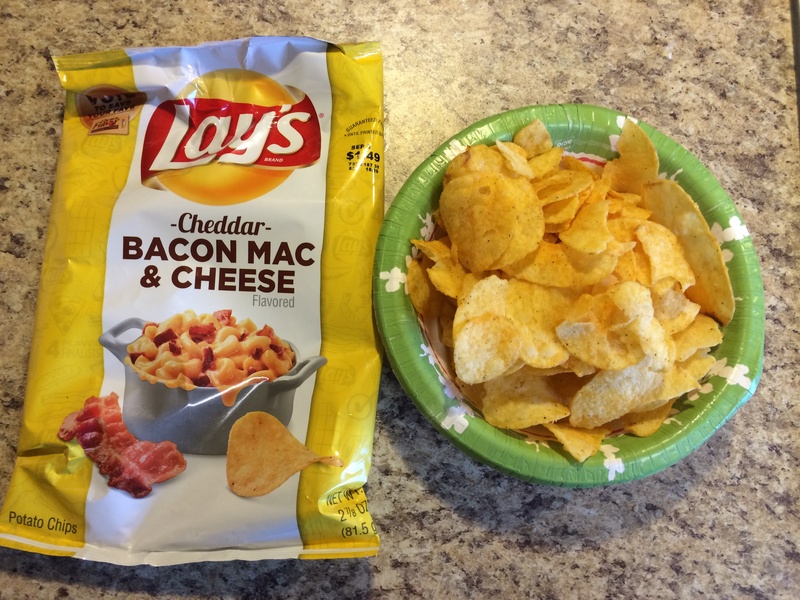 No #DoUsAFlavor chip was more anticipated than the Cheddar Bacon Mac & Cheese one. Probably no other chip in the #DoUsAFlavor promotion came out with more fanfare than the Cheddar Bacon Mac & Cheese chip. I mean who can say no to that flavor combination? I know I couldn’t. The chip definitely did not disappoint. It is the most flavorful chip out of the three. The bacon taste definitely overpowers the cheddar and mac & cheese flavors. Then again, I don’t know that I ever tasted a mac & cheese flavor to begin with although the cheddar flavor was surely there. I would say that the chip tasted more like a bowl of potato soup rather than a bowl of macaroni & cheese. But it still tasted good and I found myself eating several more chips until I told myself to stop chowing down and start writing. 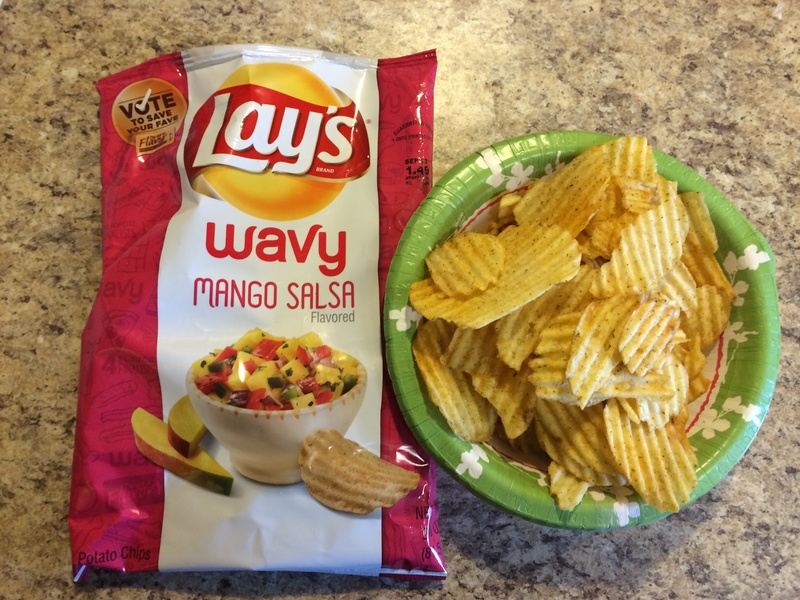 In the end my favorite chip in the #DoUsAFlavor promotion was the Wavy Mango Salsa flavor. 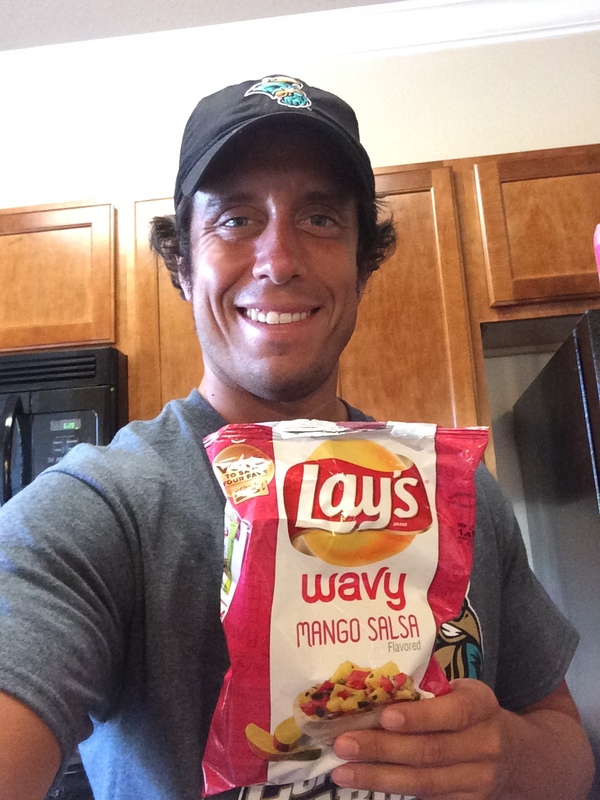 My favorite chip out of the three was the underdog, the Wavy Mango Salsa chip. The flavor was just so different and refreshing. Like I said, pair it with some real salsa and it will be magical. The Cheddar Bacon Mac & Cheese chip landed closely behind in the second spot. Do yourself a favor and pass on the Wasabi Ginger chip, it doesn’t even deserve a third place ranking. Hope you enjoyed my #DoUsAFlavor review. I went to great lengths to bring it to you. Although I am sad that the cookie dough flavor never came to fruition I can say that Lay’s did pretty good for itself with the Mango Salsa chip. However, my prediction is that American votes for the Cheddar Bacon Mac & Cheese chip to become a permanent flavor. Can’t wait for the next flavor competition to come out so I have yet another excuse to eat multiple bags of potato chips. Don’t Blink. An Ice Cream Challenge: Do It or Not? In the middle of this past week the Sun News tweeted out a link of the ten best ice cream shops in the Myrtle Beach area. Naturally I tapped my thumb on it as I love ice cream and I have had a great time trying out some of the different parlors here in South Carolina. As I read through the article one place especially stood out. Called O.D. Pavilion Ice Cream it wasn’t the cool looking sundaes in waffle bowls that caught my attention. Rather, it was a cool little (or big) promotion that was advertised. Called the Waterdog Challenge it was the frozen dessert version of your typical eating contest. 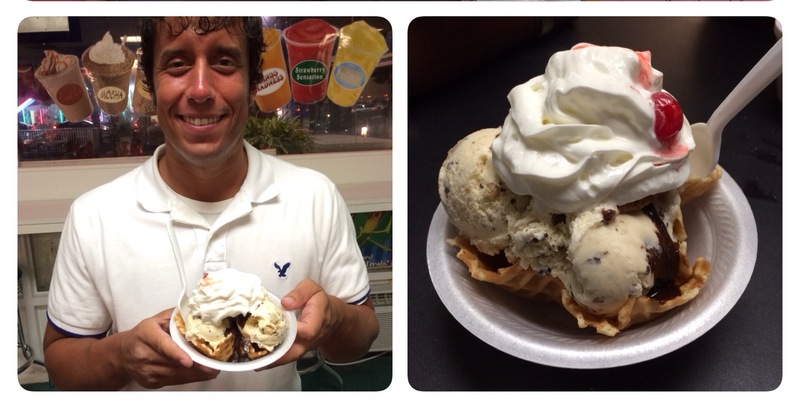 I learned that the Waterdog Challenge consisted of seven scoops of ice cream, five toppings, whipped cream, a cherry, and a large waffle bowl. Except for the time I took a stab at eating a gigantic hot dog, I have never gotten too excited over eating challenges. I love watching Adam Richman conquer them on “Man vs. Food” but I have never had the desire to do one myself. This is O.D. 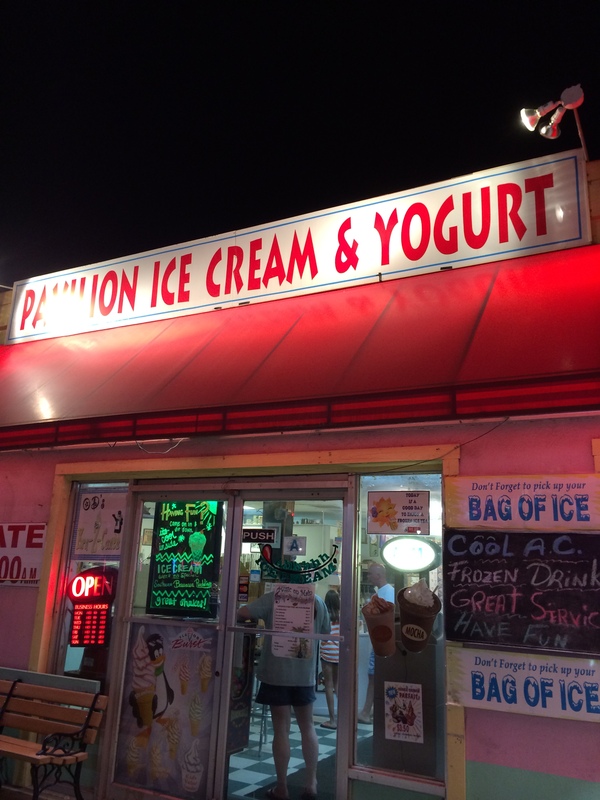 Pavilion Ice Cream in North Myrtle Beach. But the Waterdog Challenge was different. This was ice cream. This was my thing. It was only seven scoops. I could do this. I told Sidney to block out her calendar on Saturday night so we could go to O.D. Pavilion. I told her about the challenge and my plans to possibly do it. What was my motivation for wanting to complete such a gluttonous task? Quite simply I wanted the free t-shirt, the Facebook recognition on the parlor’s page, and of course a killer blog topic. The challenge weighed heavily on me for the next 24 hours. Because of my OCD and organized nature I called the place on Thursday night to make sure the challenge was still offered and to inquire about pricing. The guy who took my call informed me that they still offered the challenge (great!! ), it was $14.95 to do (sweet…not a bad price at all), and participants had five minutes to complete it (oh, crap). How did I completely forget about a time limit?! All food challenges have time limits. Somehow I totally overlooked this minor detail. The worst part about it was the duration of it…FIVE MINUTES. Are you kidding me? Five minutes for seven scoops of ice cream? I couldn’t begin to think about the brain freeze pain that would accompany such an attempt. For the most part I put to rest my aspirations of completing the Waterdog Challenge. Last night though we still went on as scheduled for ice cream at O.D. Pavilion. I am pretty sure I am the only one who would travel 30 minutes for ice cream in an area that has shops on every single corner. During the drive from Myrtle Beach to North Myrtle Beach I told myself that when I walked in the parlor if it seemed right I would put my doubts aside and take on the challenge. But it didn’t seem right. When we walked in O.D. Pavilion I knew it wasn’t meant to be. The place was rather small, it was busy, and disorganization was evident. I was not about to put the employees through the headache of making the ice cream challenge, finding a suitable place for me to do it at, and timing me. I myself didn’t feel comfortable in the close quarters. I kept thinking that I was just setting myself up for embarrassment and failure. So I passed. I totally wimped out and purchased their cookie dough sundae. After a few days of heavy thinking, I ended up just ordering the cookie dough sundae at O.D. Pavilion Ice Cream. Sidney and I sat in the corner of the parlor that had photos of the dozen or so successful Waterdog Challenge participants on the wall. All male they looked very normal and in no obvious state of pain. Many of them looked fit and young, with big smiles across their faces. As I ate my ice cream I couldn’t help but think I could have completed the challenge. Clearly I missed out on the chance to obtain eating glory and the opportunity to write a blog post much more interesting than this one. No pain, no gain. Don’t Blink. Today everyone in the University Communication office at CCU was treated to a wonderful treat for lunch. To coincide with our Vice President releasing the Communication and Marketing Strategic Plan, my co-workers and I were invited to pick up a copy of the report and then indulge in a truly Southern lunch. 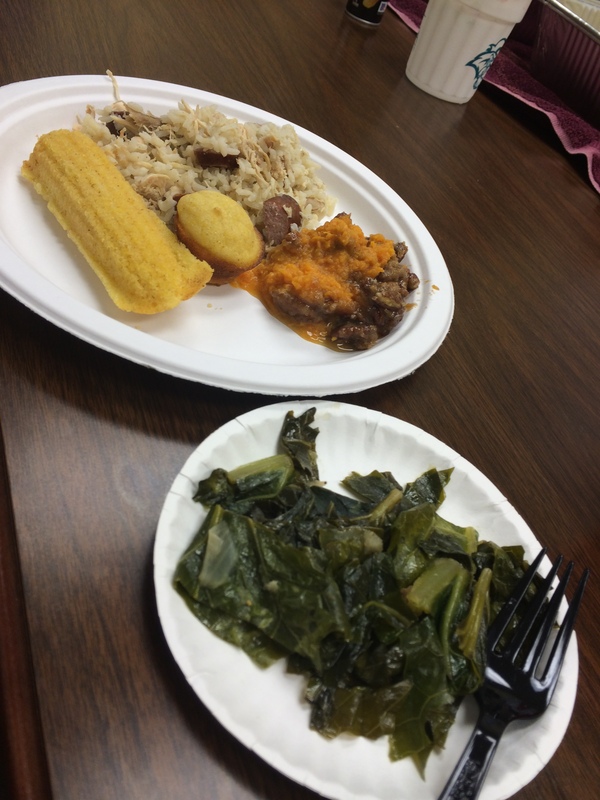 Our Director of News and Public Affairs, Martha Hunn, completely outdid herself and prepared a feast consisting of chicken bog, sweet potatoes, collared greens, and cornbread. When I say feast I mean it in every sense of the word. Martha made enough food to feed probably the whole university rather than just a single department. Well, perhaps I shouldn’t have put “probably” in that last sentence because it is a fact. As the lunch started to wind down we had numerous people from different departments come in to fill up a plate with some warm food. By the time they had all dished up we still had leftovers! Now I know the question on most of your minds right now is “What is chicken bog?” Great question! To tell you the truth, I had no idea in the world what it was until I went for my onsite interview at CCU in March. No other than Martha told me about the magical combination of ingredients while we ate lunch that day. When I was hired and arrived on campus I kept expressing to her how much I wanted to try chicken bog. She continually assured me that she would make some for me and today was the day. This is the big batch of Chicken Bog that Martha made today. 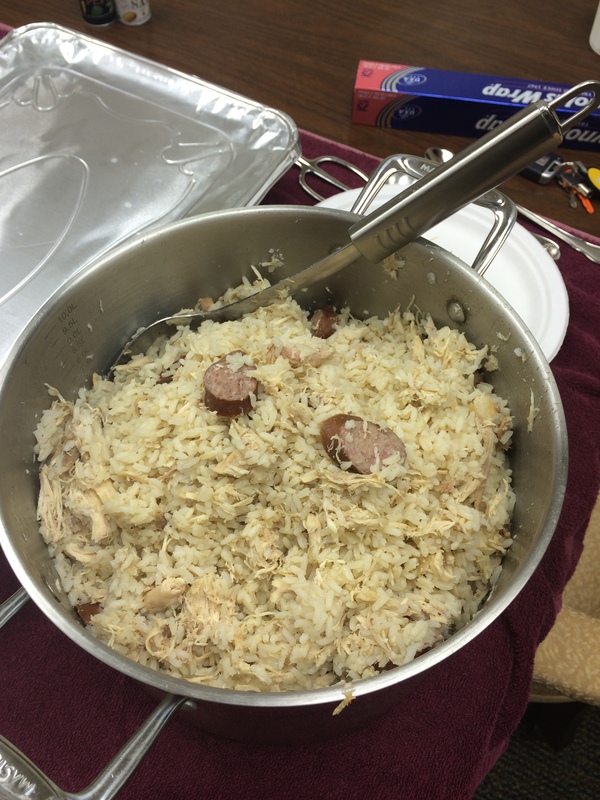 Chicken bog is a rice dish mixed with chicken, sausage, and spices. It is not just a Southern dish but a South Carolina dish. If you talk to Martha she will tell you exactly how it should be prepared. The chicken needs to be cooked a certain way and for a certain time before you add your rice. Not all “bogs” are created equal…except for people like me. My eyes light up when I hear about a dish that combines chicken, sausage, and rice so you can bet I will scarf down any version that ends up in front of me. Take a look at this amazing spread! I enjoyed the cornbread and the collared greens (first time ever having them) but I was blown away by the sweet potatoes and chicken bog. The potatoes had a sweet pecan top layer that tasted like candy and gave new meaning to “sweet” potatoes. The smooth and flavorful potatoes would have tasted just splendidly without the pecan layer but the combination of those two things made for a dynamite dish. This is the plate (or should I say plates?) that I dished up for myself. The chicken bog proved to be everything and more that I had anticipated over the past several months. For such a seemingly simple dish it tasted so good. In the past I have had jambalaya and I would say that the taste was similar. But the jambalaya was nowhere near the quality of Martha’s chicken bog. It had such a perfect consistency and a taste that wasn’t overpowering yet pleasant in a way that you kept wanting to take bite after bite. I am happy to say that I will be able to take bite after bite for a little while longer. I was fortunate enough to take home a plate. I am already looking forward to eating it. All I can say is that I hope we start releasing strategic plans more often than just once a year. Don’t Blink. Today is the day I work extra hard and blog about five topics instead of one. Actually, I honestly save time writing briefly about five topics instead of an expanded commentary on just one. You know how I make these multi-topic blog posts even shorter? I barely say anything in the introductory paragraph. Let’s get to the content! CCU Now a Pepsi Campus – Last week Coastal Carolina University officially became a Pepsi campus. Coca-Cola machines were taken out and replaced by blue machines carrying the flagship drink, Mt. Dew, Sierra Mist, Dr. Pepper, and the other regulars on the Pepsi lineup. You might think a beverage provider is not a big deal but let me tell you…it is! On the first day of the change I asked our social media audience what their favorite Pepsi product was and the response rate was crazy. Of course we just didn’t find out about their favorite Pepsi drink, we found out about their opinion on the beverage provider switch in general. The verdict? 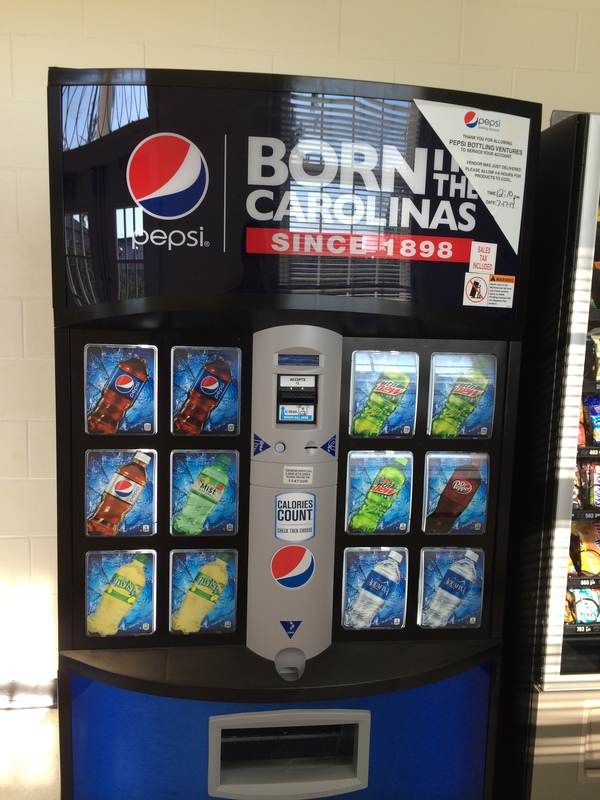 CCU is very happy to have Pepsi on campus. Personally I am too, I have always preferred Pepsi over Coke. One of our new Pepsi machines on campus. This one can be found in the building I work in. 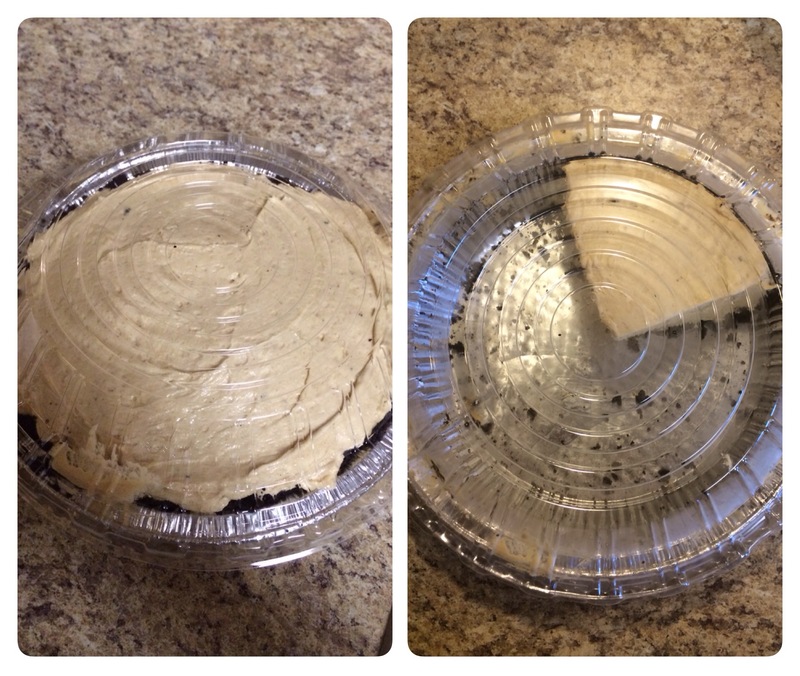 Peanut Butter Pie – Last Thursday, Sidney brought over a homemade peanut butter pie for me. She handed me the pie and it seemed like it weighed ten pounds. Made with peanut butter, cream cheese, whipped cream, butter, and Oreos (for the crust) it tasted like absolute heaven. She warned me to just take a little sliver of a piece because of its richness but I couldn’t help but get more after that initial piece. One week later and I am proud to say that I still have some left. I wish I could serve all of you a piece so you could taste something really amazing (and definitely NOT low-fat)! It has been a whole week and I am pleased to report that I still have some pie left! Heaven is for Real – On Tuesday night I watched “Heaven is for Real.” The movie deals with a young boy who has a near-death experience and visits Heaven. When he returns his family struggles with telling the story to others, especially the dad’s church where he serves as the pastor. The movie is based on a true story. I personally thought the movie was okay. I wish it dealt more with the actual near-death experience itself rather than the fallout it caused the dad with his church. I was looking for more images of Heaven and more details of his visit. I am fascinated by NDEs, as I wrote about two years ago, so I am a little surprised it took me this long to finally watch this movie. Managing Digital Assets Upon Death – The other day I read an article about the trouble that occurs when a person dies with a large online presence but no direction in his/her will about what to do with the inventory. E-mail accounts, websites, blogs, social media, etc. still exist when someone passes on. For several years now I have been adamant that if I bit the dust I would want my social media accounts deleted. I find it a little creepy seeing a Facebook page of a deceased user. Obviously that person can’t respond to posts, can’t do anything if the wall is taken over by spam, and is powerless if the account ever got into the wrong hands and someone started to post on behalf of the dead person…talk about an upsetting issue. I would like my blog to live on in cyberspace and I could care less about what happens to my e-mail accounts. But it is important to have directions laid out for when the time does come. Don’t Call Me That, Bro – If there is one thing I despise getting called it is “bro.” You know the context I am referring to, right? The type of vernacular where it is tacked on to the very end of a sentence such as “You mad, bro?” You will find many people who will use it constantly and without any regard to who they are talking to. I have heard individuals refer to females and their parents as “bro.” It makes me feel disrespected enough getting referred to in that way, I can’t imagine how girls and dads feel. It just sounds so uneducated and trashy. Please don’t call me bro. Can’t wait for work tomorrow! 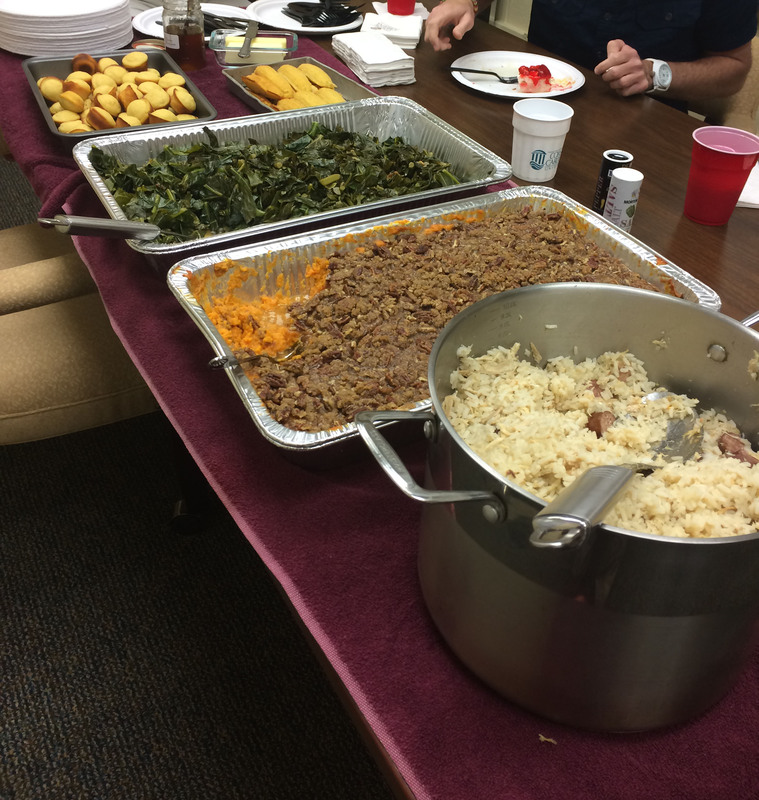 My office is getting treated to a full out Southern meal with a very unique main course. I hope to write about it this weekend. Stay tuned for that and have a wonderful night. Don’t Blink. This evening after work I stopped midway between campus and home at a CVS to drop off my Redbox disc. This specific location has almost turned into a routine stop for me as I rent a movie sometimes four times a week. Anyway, I got out of my car as the rain poured but the sun shined. I approached the kiosk and tried to quickly return the movie. Not happening. The rain had drenched the screen and taken away all the sensitivity of the touch system. It was impossible for me to select the “return” command and give back my disc. Slightly annoyed I hopped back in my car and closer to my apartment complex I turned into another CVS. As I pulled up to the kiosk I saw the typed out sign that identified the machine as out of order. With the next Redbox kiosk out of my way at a Piggly Wiggly location I told myself I would just eat the nightly late fee and return home. Cheap – Renting a Redbox provides cheap entertainment. For only $1.20 or $1.30 you can buy yourself a couple hours of relaxation inside the comfort of your own home. Fast – The whole process of renting a movie from a Redbox kiosk is quick and painless. You simply approach a station and make a decision. You don’t need to worry about walking around a store, searching for a title, or dealing with employees. Easy to Return – The beauty of Redbox is that you can return a movie to any kiosk, not just the one you originally rented from. This offers so much leverage and convenience. On a Sunday evening I might be at a supermarket that has a Redbox kiosk but is way out of the way from my work commute. No worries. I have the luxury of renting the movie there and then returning it at a different kiosk at an entirely different business on my way home from work the next day. 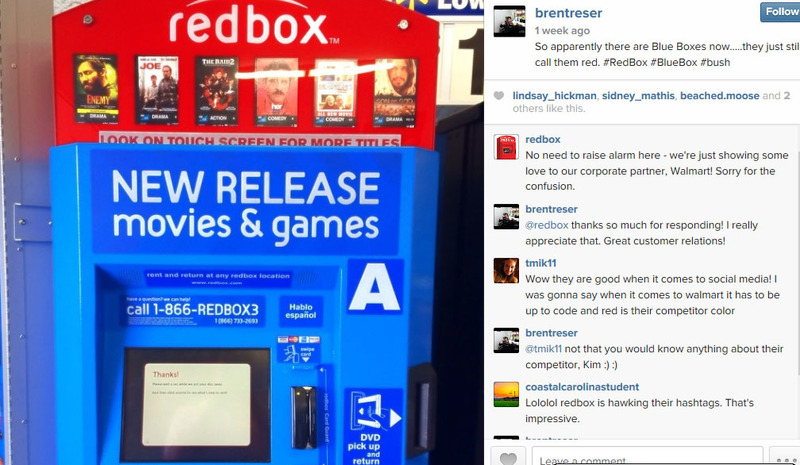 Great Social Media Team – The other day I took a photo of a BLUE Redbox inside of a Wal-Mart. I threw up the image on Instagram and said something about Redboxes turning into Blueboxes. Within just a couple minutes the Redbox Instagram account responded! Saying that there was no reason for alarm as it was just a cool way to give a nod to its corporate partner, the account assured me that most kiosks would remain red. I loved the timely and informative social media response. Redbox quickly responded to my Instagram post. Pressure to Make a Decision – Nothing is worse than walking up to a Redbox kiosk and right when you click the “Rent Movie” prompt you sense someone waiting behind you. It is no fun making a decision on a movie when you know someone is breathing down your back. It causes anxiety and hasty decision-making. Swipe Mania – More than once in my Redbox renting career I have swiped by debit card about 253 different times before my info was read. I would swipe up and I would swipe down to no avail until finally it registered and my movie popped out. Finger and Screen Not Synched – Sometimes, like today, my finger swipes don’t register or line up with the Redbox commands. I tried over and over to activate the “Return Movie” command early this evening but it wasn’t meant to be. The wet screen couldn’t feel the touch of my finger. However, dry screens give me this problem at times too. I will want to check out but the screen is so out of sync that I will have to press in and around the command countless times before finally touching the sweet spot that will let me pay. Deception About New Releases – I love renting movies that I don’t know much about. If I highlight a certain selection and the first two sentences of the summary draw me in I will rent it. However, this has caused me trouble in the past. I always assume that the movies offered under “new releases” are in fact new releases. They aren’t. More than once I have selected a movie, returned home, and upon putting the movie in my DVD player I discover that the film is 15 years old. What is that film doing inside the Redbox in the first place? So random. So I think that should just about do it for my analysis of Redbox. Definitely a subject worthy of a 800+ word blog post, right? Enjoy your future Redbox renting, just please don’t visit the one I am at. I hate people standing behind me. Don’t Blink. In my effort to frequent pretty much every restaurant in Myrtle Beach I found myself in a unique spot with an even more unique promotion. Off Socastee Blvd. there is a dusty place in a mini strip mall with a couple other businesses. Called the Sun-Up Sports Pub & Grill it is your quintessential dive with greasy food and cold drinks. From what I could tell it has its regulars and most likely the place had not been updated in years. Sidney and I recently visited this establishment for the first time. We sat down and played a trivia game against each other. We finished our trivia contest (in a game where you can easily rack up 13,000 points Sidney beat me by the smallest of margins…ONE POINT) and asked for our tab. With the check came four little raffle tickets. The bartender explained that the raffle tickets corresponded to the couple rounds we ordered. For each drink purchased, she explained, you receive one ticket. You then write your name on it, give it back to the bartender, and it is placed in a pot. Here comes the interesting part. Tickets are gathered all week long and then on Thursday at 8 p.m. there is a big drawing. A Sun-Up employee reaches into the pot and grabs a ticket and announces the name to the whole place. If the person is present at the time of his or her name being called then the lucky customer receives a cool $500 cash prize. If the person is not present then the Sun-Up doesn’t have to worry about paying out five Benjamins. The bartender proudly stated that this little charade packs the place on Thursday nights. She also said that about half the time the person is actually present who has his/her name drawn. Of course numbers rushed through my head. Even if they paid out the $500 every single week the Sun-Up would still most likely be bringing in a decent profit each Thursday night with a crowded bar. Heck, chances are the winner would probably be giving most of the money back to the place anyway by purchasing celebratory drinks and shots for everyone else. However, on the nights where a winner isn’t present the Sun-Up gets to take full advantage of a packed place without losing a dime. Even if you pay out or don’t the joint still gets the valuable opportunity to make a favorable impression on customers and increase the chances that they will come back through the doors down the road. I love something as straight forward and enticing as this. You won’t see me rushing down on Thursday nights (I get up early on Friday) but I know a lot of people who would, even with only one ticket in the probably bottomless pot. In my opinion this a great example of a business doing something innovative to stand out among all the other similar establishments. Well done. Don’t Blink. On Friday Sidney and I went to the midnight showing of “The Purge: Anarchy” at the Broadway at the Beach movie theater. Before I talk about a certain issue in our theater let me first briefly discuss the film. To those not in the know, “The Purge: Anarchy” is the sequel to “The Purge.” These movies depict a future America with a new government that sanctions one night each year where murder is legal. It is basically the biggest “holiday” on the calendar and is credited for bringing crime to an all-time historical low in the country. Although the second Purge movie is a sequel, nothing other than the concept of the Purge night is related to the first one. Our movie tickets for “The Purge: Anarchy” on Friday night. On to the issue I mentioned above. I can usually effectively block things out that might hinder my enjoyment of something and I think that is why I still enjoyed myself on Friday night. 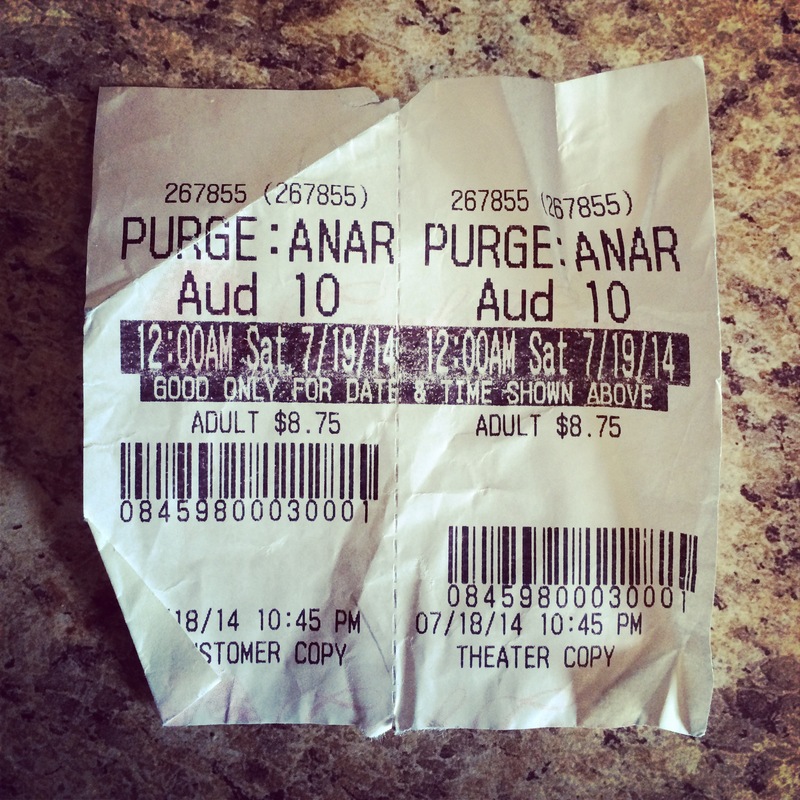 You see, I had never watched a movie with a ruder audience than the one I found myself sitting with during “The Purge: Anarchy.” From the start of the previews to the end credits it was as if everyone thought the audience was there to hear their special commentary rather than watch the featured film. You can chalk some of it up to us watching a movie at midnight at a theater in a district of Myrtle Beach that is home to the coolest bars and clubs in town. Judging by the antics of most people around us, they more than likely had a few strong ones before entering the theater. But I am not about to excuse the behavior all on the possibility of alcohol and who knows what else. Rather, I think just a lot of immaturity, heightened sense of self, and lack of courtesy contributed mightily to the amateur comedy hour. People all around us yelled, heckled, and laughed (it was a thriller/horror movie) the whole time. If they had something to say instead of just bothering the person next to them they decided to announce it to the whole auditorium. Besides other things, right off the top of my head I recall people hollering “Kill that B@#$% too,” “SHOOT HIM UP,” and “That dumb@$$ deserves to die!” Like I said, these comments never let up. I will give it to a very select few in the audience, their comments were witty, almost as if they had already seen the movie beforehand and then wrote jokes for their return trip to the midnight showing. However, I don’t care if what they have to say is Jimmy Kimmel type material, I don’t want audience participation during my movie. I won’t get too worked up about this though. Very rarely does this happen when I venture to the theater. In fact, I guess every once in a blue moon you should expect a bad crowd when going to the movies. I mean l have to be honest, I have sat with bad crowds at sporting events, public ceremonies, and even church. It is just something that you have to block out when faced with. No more midnight movies for me. Don’t Blink.